At the same time, the seriousness of the challenges which the Church in America, under your leadership, is called to confront in the near future cannot be underestimated. The obstacles to Christian faith and practice raised by a secularized culture also affect the lives of believers, leading at times to that "quiet attrition" from the Church which you raised with me during my Pastoral Visit. Immersed in this culture, believers are daily beset by the objections, the troubling questions and the cynicism of a society which seems to have lost its roots, by a world in which the love of God has grown cold in so many hearts. Evangelization thus appears not simply a task to be undertaken ad extra; we ourselves are the first to need re-evangelization. As with all spiritual crises, whether of individuals or communities, we know that the ultimate answer can only be born of a searching, critical and ongoing self-assessment and conversion in the light of Christ’s truth. Only through such interior renewal will we be able to discern and meet the spiritual needs of our age with the ageless truth of the Gospel. 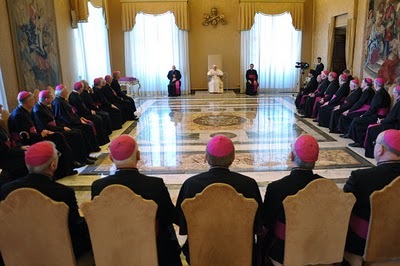 In the end, however, the renewal of the Church’s witness to the Gospel in your country is essentially linked to the recovery of a shared vision and sense of mission by the entire Catholic community. I know that this is a concern close to your own heart, as reflected in your efforts to encourage communication, discussion and consistent witness at every level of the life of your local Churches. I think in particular of the importance of Catholic universities and the signs of a renewed sense of their ecclesial mission, as attested by the discussions marking the tenth anniversary of the Apostolic Constitution Ex Corde Ecclesiae, and such inititiatives as the symposium recently held at Catholic University of America on the intellectual tasks of the new evangelization. Young people have a right to hear clearly the Church’s teaching and, most importantly, to be inspired by the coherence and beauty of the Christian message, so that they in turn can instill in their peers a deep love of Christ and his Church. The Empire State delegation will be followed next week by the bench's Region III, comprising the bishops of Pennsylvania and New Jersey.